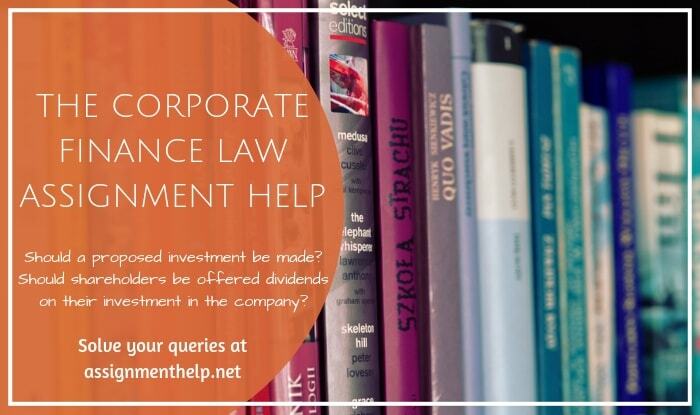 Among the financial activities that a corporate finance department is involved with are capital investment decisions. At Assignment Help, we have sub-divided this study into a number of elementary questions addressing specific needs of the students and professionals. Should a proposed investment be made? How should the company pay for it with equity or with debt, or a combination of both? Should shareholders be offered dividends on their investment in the company? These are just some of the questions a corporate financial officer attempts to answer on a consistent basis. The course consists of the issues which include the management of current assets and current liabilities, inventory control, investments and other short-term financial issues. The specific and in-depth focus is upon the issues which relate to and include legal aspects of new capital purchases and investments. The study covers the legal management of the division or department that oversees the financial activities of a company, primarily concerned with maximizing shareholder value through long-term and short-term financial planning and the implementation of various strategies. Everything from capital investment decisions to investment banking falls under the domain of corporate finance. The course at Assignment Help exhaustively addresses the fundamentals of financial economics as encountered in selected areas of corporate, bankruptcy, and securities law.